Corporate Social Responsibility | Mutuk5. I love the manner in which multinational enterprises jump at the opportunity to be associated with positive publicity that casts their purely money-driven corporate philosophies in a more appealing guise to their unquestioning, highly-gullible customer base. Corporate social responsibility has become the latest fashion trend on the commerce catwalk and like much of fashion itself, only serves to mask the banal and basic truth underneath all the swagger and sophistication. The truth is, multi million dollar giants such as Van De Kaap, Shell, McDonalds, Coca Cola, Nokia, Toyota and so on care very little for the interests of the impoverished Tricontinental inhabitant (Tricontinental is a literary substitute for “the third world”) but will happily pretend that they do if doing so casts them in a better light to their customers. Just how much the clothes retailer “United Colours of Benetton” and electronic giant “Sony” care abut the interests of the proletariat and the downtrodden in global society (i.e. the majority of Tricontinental states and their subjects) is up for open debate. However, the company does have an established and controversialist history of provoking the norms by which the world is governed through its advertising and branding campaigns. 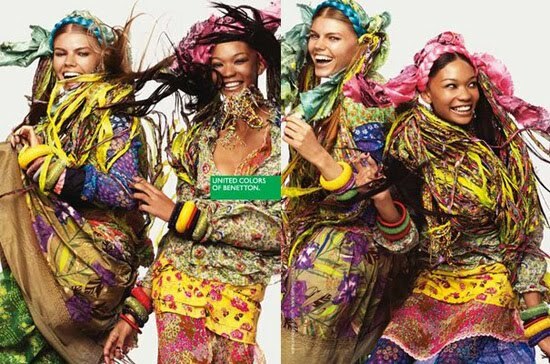 The question to ask when one looks at the following set of campaign pictures from United Colours of Benetton and Sony is whether they’d make any difference whatsoever if all the subjects that feature in them were of the same ethnic composition. The fact that they have been as provoking as they are ratifies and explains the discomfort that many feel about the idea of racial heterogenity and solidifies the notion that the majority of political and economic power is concentrated in the hands of a particular group of society who’ve built a cultural hegemony that suits their own interests at the expense of greater gains that could be made for the good of all society. The following pictures are taken from various advertising campaigns from the clothes retailer, United Colours of Benetton and Sony. 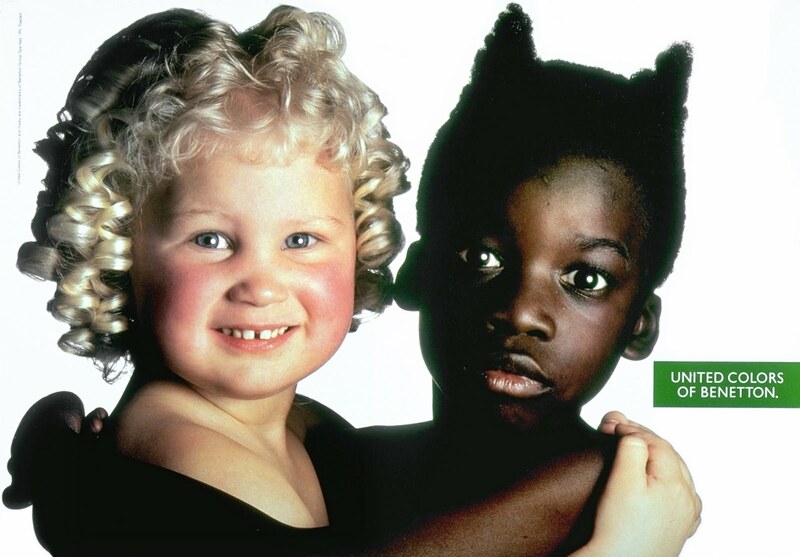 United Colours of Benetton advertisements have, for the last couple of decades been anchored on images to promote peace, tolerance, multiculturalism and to challenge stereotypes. The altruistic or genuine motives of such a campaign are debatable. They do however transcend the purely profit- driven commerical campaigns of the majority of large multinationals, many of whom simply flirt with the notion of encouraging togetherness through branding through the pseudo idealism of a banal advert that reeks of cash-seeking intent and does little to provoke the fundamental stereotypes that our world is plagued by. Sony Playstation Controversy part 1: The battle of the races ? Sony Playstation Controversy part II : The battle of the races ? United Colours Of Benetton: Black mother breastfeeding white baby. This is arguably the most controversial of all UCB ads. Take away the difference in colour between the two subjects in the picture and there’s no issue whatsoever. We live in a world tainted in the idiocy of mankind’s inability to his judge his fellows on terms that are not exclusively and solely based on skin pigment. 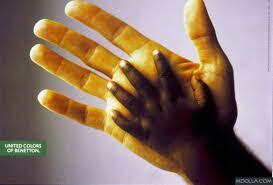 UCB: Large White palm overshadowing a smaller, child-likeBlack hand. Reflects global social hegemony in a world that is oddly enough termed postcolonial for the most part. 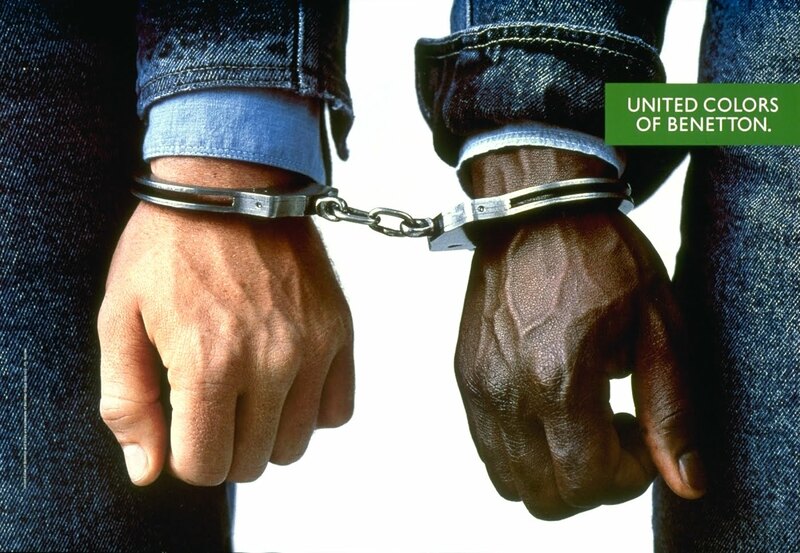 UCB: Black and White bound together in handcuffs. The forced coexistence of separate forms of interpreting the world ? 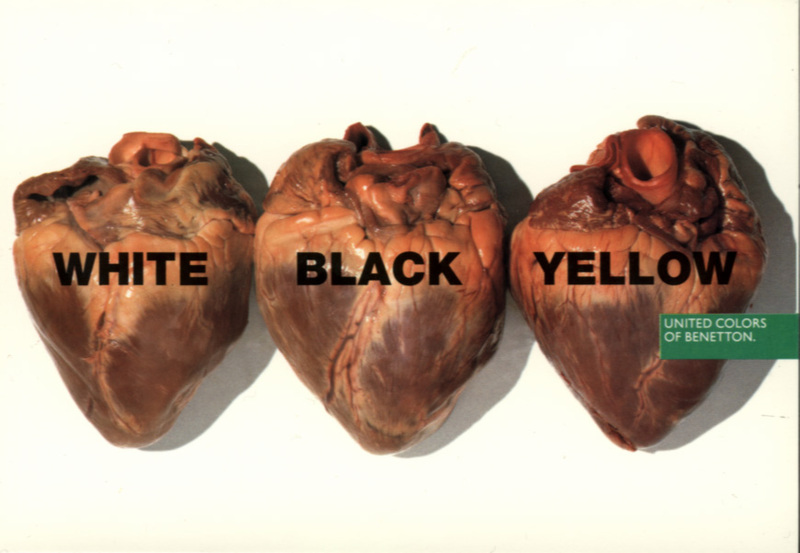 UCB: Black, White & Yellow hearts, all of which are identical to each other. Mankind stems from the same core genetic structure, unlike other organisms such as monkeys and birds, who oddly enough even though they are physically extremely different from each other (certainly more than one human being is from another) do not deliberately and with predetermined motive specifically hunt down and kill each other based on criteria that has anything to do with their physical attributes (colour included.) Who are we to say that we are the most intelligent race on this planet ? We haven’t even gotten past the notion of accepting all the different versions of ourselves which is rather elemental if not wholeheartedly daft! UCB : A swipe at religious conformity. Love transcends the banal and inconclusive rules and norms that various parts of human society have attempted to codify. UCB: The world is a melting pot of different races and peoples that are bound inseperably. UCB add in which the white child is depicted as angelic and divine whilst the black child is elucidated as devlish if not cynical. Invariably, they are both bound to each other. This is a parody on the hegemony of the current world order which does everything it can to come across as being fair, just and superior when compared to those who are subjugated by it. UCD: A Black, White and Asian child each with their tongues’ stuck out. This ad was banned in the Arab states where advertisements are foribidden from depicting internal organs. The children seem to be cheekily mocking the social norms of our world, i.e. that racial differences are something that the better nature of man (if such a construct even exists) ought to look beyond.